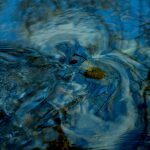 3rd June 2017: A new exhibition of 25 photographs of water opened this week at the Visitor Centre of the European Commission Joint Research Centre at Ispra in Italy, under the title of The Still Dynamic. The opening of the exhibition followed a talk on The Art and Science of Hydrology that I gave at the JRC as part of their Art and Science programme. The image of the Eden at Shoregill, 2015, No. 11, used on the exhibition announcement, proved to be the most popular amongst the people there. The exhibition will be open until mid-July 2017.